Bond lounge grill has a terrace on the side you can soak up some rays on a nice summer day. 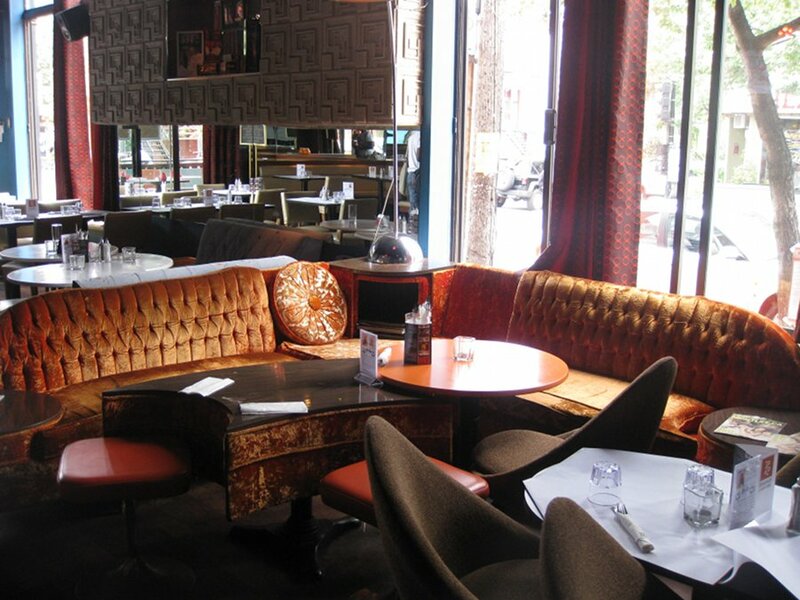 Should you decide to go inside and avoid the sun you will be amazed by the interior with some interesting tables and sofas showcasing a combination of 70’s and 80’s décor that really reminds you of all those James Bond movies. It’s the little details like the ceiling with its dark detailed tiles, sofas with their funky orange upholstery and, not to mention, a large well stocked bar. The menu is small and wasn’t even on paper. It’s basically a one egg dish with option of meat, two eggs dish with meat option, Croque Monsieur and an omelette; That’s it, that’s all. Oh, and you get coffee with free refills with your order as well. I have read other items on their site since I last went so this may have changed. My friend started off with the Croque Monsieur ($11.95) which is a dish I rarely have. 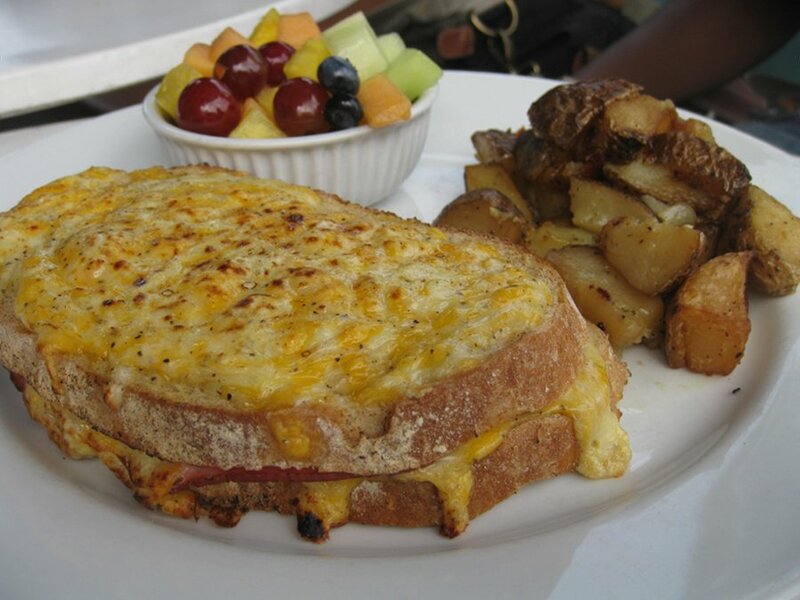 A croque monsieur is two pieces of bread with cheese and ham inside and topped with more cheese. My friend is a huge fan of this and after trying a bite I can see why. The cheese and meat worked perfectly with the bread, the dish was nice and warm as well as very filling. The dish also came with some potatoes and a fruit bowl. The potatoes were good, and the fruit was very fresh and tasty. There was also coffee and free refills which is something we made use of frequently since the coffee was very tasty and good until the last drop. 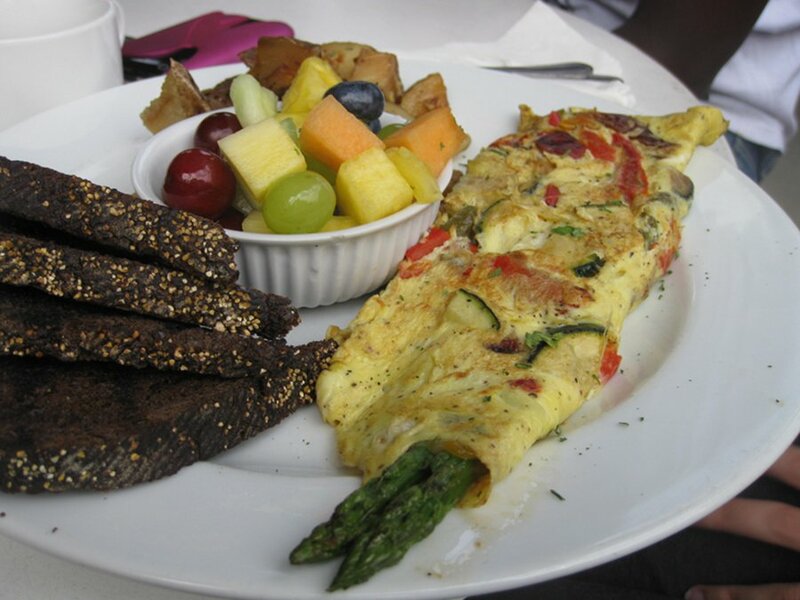 The vegetarian omelette ($9.95) came served with a side of fruit, potatoes and a dark bread. The potatoes and fruit were similar to the previous dish ordered and the dark bread was nice to see on the menu since it offered some variety. The omelette had asparagus inside it as a whole. Normally, asparagus on a plate worries me since it can be tough to chew but this was not the case. Chalked full of veggies, this omelette was tasty. Lastly, my dish was the two eggs, bacon and sausage ($10.95). 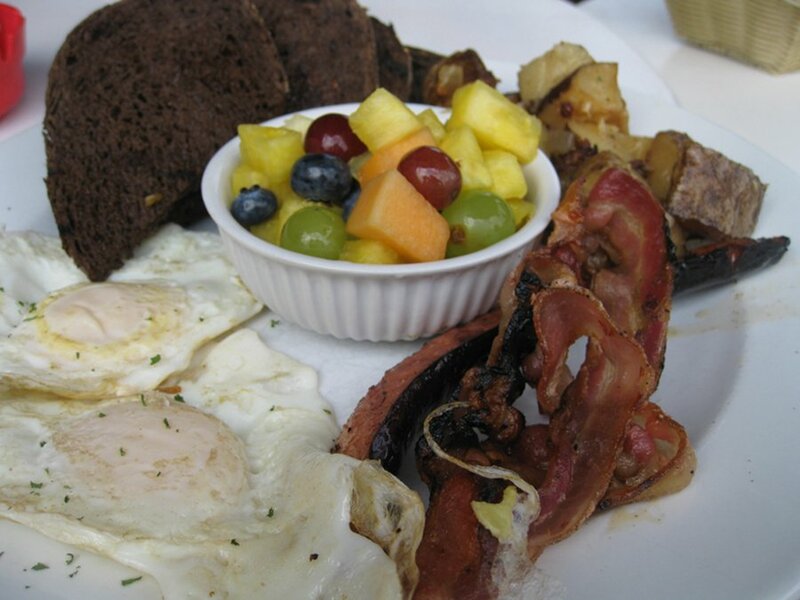 This is a kind of normal dish on paper as it has your eggs, bacon, fruit, bread, potatoes and sausage. I felt that 10 dollars was a little much for it but they do distinguish it by having some small touches like the dark bread and a European sausage which is not your normal breakfast sausage. The sausage was larger than normal and it also had a smokey taste to it. I felt they did a good job to distinguish the dish from the norm. The service was really friendly and refills were frequent. Our waiter did a good job of explaining the menu and what Bond Grill offered even outside of brunch. With a limited menu you pretty much have the omelette option or the one/two egg dish with no meat. In theory, it’s 50% of the menu but, in reality, there is not much choice. 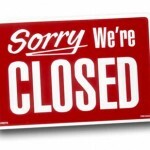 There is no health menu nor are there vegan options so keep that in mind if you’re looking for that. 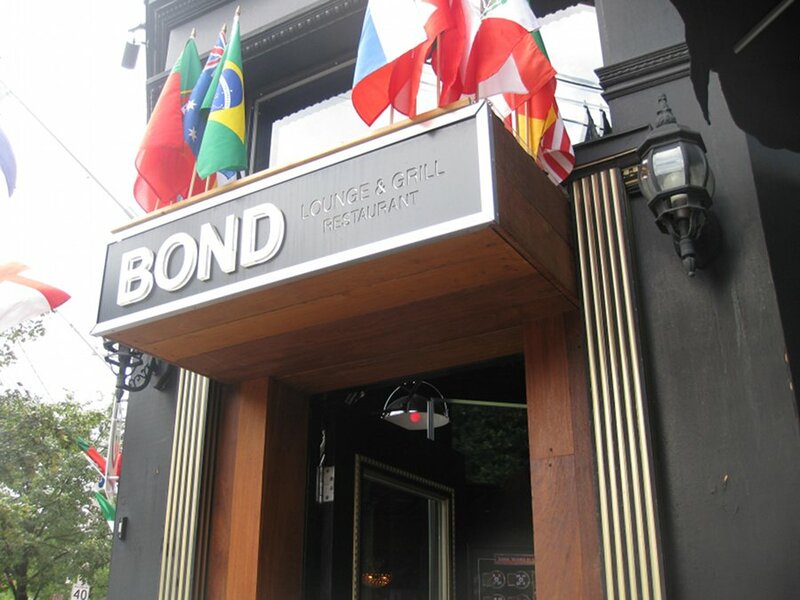 I enjoyed Bond lounge grill; I loved the décor; the food was good; the price was normal; the coffee was amazing and the little extras helped make the dishes special. The menu is still small and the schedule is likely to change from season to season or month to month based on what the owner told us but if it’s open and you want a spot that isn’t overcrowded and kind of laid back and funky, Bond Grill is the place for you. 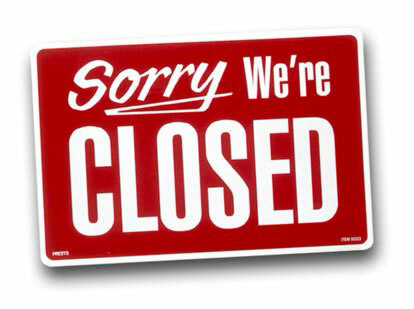 This restaurant is no longer opened for breakfast!